Happy Friday, everyone! I have a cute birthday card to share with you guys today. I used the My Mind's Eye Hootenany Six By Six paper pads. I love these small paper pads....they are a great way to build your paper collection with out spending a fortune. They are perfect for card making. 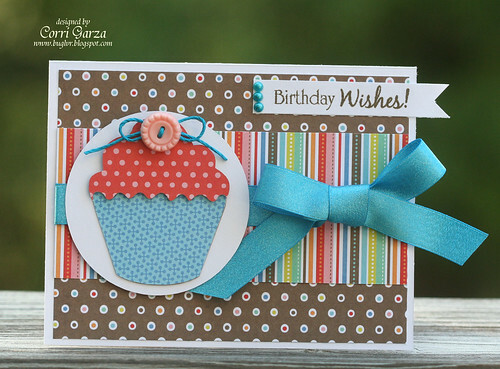 I cut the cupcake with my Cameo from this file from Lori Whitlock. I didn't use the cupcake wrapper portion of the cut. The button is from October Afternoon - Cakewalk Collection and the sentiment is from Scrappy Moms Stamps. Super cute. Love the papers. Beautiful card!! Love the colors!